Teaching inferencing, the shared book reading way. Teaching inferencing to students with language impairment can be important, because they may find it difficult to generate implied meaning from text independently. An inference is a prediction or deduction about something in written text often to do with what the character may see, hear, smell, taste or feel. An inference contrasts sharply with mere observation, or literal language. In the abover inference example, there is nothing stated explicitly about it being a hot day. But the reader can infer that it's a hot day by the information presented, such as 'the shade of the tree beating back the heat; and Billy changed into his shorts and applied sunscreen.' All of the language strongly suggests that it is a hot day. Inference can be a difficult skill for children with language impairment to learn. Inference tends to rely on having good word and world knowledge - a solid vocabulary knowledge, and an extensive semantic word knowledge network. We know that children with language impairment often have impoverished vocabularies, which can impact on their ability to understand information in text that is not explicitly stated. So an important question is, what is the best method of teaching inference to children with language difficulty? Apart from generally improving a student's vocabulary and world knowledge, a good way to improve inference skills is to ask prediction questions. The student could read a passage from a book and then asked what may happen next and why. For a more in depth description of inferencing please follow this link to free inferencing activities. There are several free adobe downloads, that feature teaching inferencing exercises for 7 - 11 year old students. Here we have a rather dangerous looking character. How do we know he's dangerous? 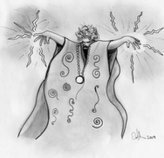 Well, anybody who has electric sparks shooting from his fingertips, has eyes hidden by deepening brows and is decked out in flowing robes, complete with arcane symbols no less, is not someone I'd be pleased to tangle with. Some of the information we can infer from this illustration is that the character is probably a wizard of some kind, has supernatural powers, and is possibly from a sword and fantasy story. This image has a large amount of information that can be surmised, or inferred. Let's tease out some of those details. 1) He's not an accountant, probably. 2) He doesn't teach at Hogwarts. 3) He's got a wicked temper. 5) He's handy to have around when dragons come a hunting. Perhaps the best method of teaching inferencing to your students is to pepper them with standard who, what, why, where, and when questions. 1) Who is this man? 2) Why does he have sparks coming out of his fingertips? 5) When did this happen? The beauty about the who, what, where, when, and why series of questions is that there is no limit to the questions you can generate, and the answers students can provide. Students may lack experience in answering inference type questions because of their teachers' inclination to focus on literal questions in the classroom, and not focus on teaching inferencing. Students may have problems employing background knowledge of a subject, and fail to link information. Students may have difficulty decoding, and are therefore not able to devote mental resources to understanding and inferring a text's deeper meaning. Students may focus on irrelevant information in the text and miss the text's deeper meaning, making accurate inferencing very difficult. Students may have poor organisational skills and therefore overload their working memory capacity, which results in failure to properly comprehend text. Students may have poor background knowledge and impoverished vocabularies, and may lack flexibility in thinking skills. Of course inference skill does not exist in an abstract vacuum. Inability to inference well in school-age students is directly linked to reading comprehension failure, and language difficulties. For more information about inference and its relationship to reading comprehension I recommend you visit these pages: vocabulary comprehension, and vocabulary and context. For an example of language therapy targeting inference, please visit the language theraoy inference page. If you would like to learn more about inference activities click on the cover image to the Inference Activities 2nd Edition sales page. Also, please sign up for the Language Dispatch newsletter. 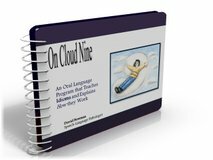 Thenewsletter provides essential monthly language intervention tips, techniques and information.